The first time Dave Shoji had the Hawaii women's volleyball team competing in the national championship match, the coach across the net was UCLA's Andy Banachowski. It was 1975, and Shoji was in his 18th match as the first-year Rainbow Wahine coach. The Star-Bulletin's list of predicted movers and shakers for 2006. Hawaii fell to the Bruins in the Association of Intercollegiate Athletics for Women title contest to finish the year 16-2. Both losses were to UCLA. Thirty-one years later, Shoji leads his personal series with the Bruins 33-28 but trails Banachowski on the all-time wins list, 1,004-897. But Shoji is poised to join his UCLA counterpart sometime next season when he becomes just the second Division I women's coach to reach the 900-win mark. Coincidentally, the milestone could be reached against Banachowski. Hawaii and UCLA meet this September in the Wahine's fifth match of the season. "I'm hoping it will happen before then," said Shoji, whose team faces Pepperdine twice, then Florida and Colorado before seeing the Bruins. "But you never know. "I've never cared about the numbers. That I have as many (wins) is due to a lot of good players coming through the program. We've had some really good teams." With a victory over Utah State last Nov. 17, Hawaii became just the seventh Division I women's volleyball program to reach 900 wins. In their 32-year history, the Wahine have won 906, with Shoji being around for all but the first nine. "When I first started (in 1975), I didn't think I'd be here this long," said Shoji, named as the coach for the NCAA's 25th-anniversary volleyball team last year in nationwide voting. "But when the wins start to pile up, you kind of wonder what you'd end up with. "Andy and I were really among the first coaches out there back then. Maybe no one else has won 900, but there will be people who follow us." 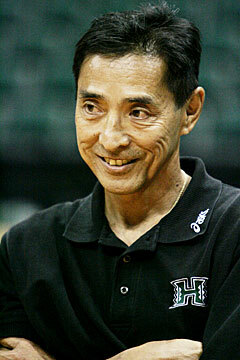 With an 897-157-1 career record, Shoji has the highest winning percentage among active coaches (.850). This season, he picked up his 10th conference and eighth regional coach of the year awards. The one number he does think about is five. After winning four national championships between 1979 and 1987, the 59-year-old coach did not think he would go this long before winning his fifth.